Digital and social business models are transforming how businesses communicate and are challenging organizations to find new ways to collaborate and adopt the latest technologies. Tools such as Lync and Skype allow for greater collaboration beyond IM and presence. 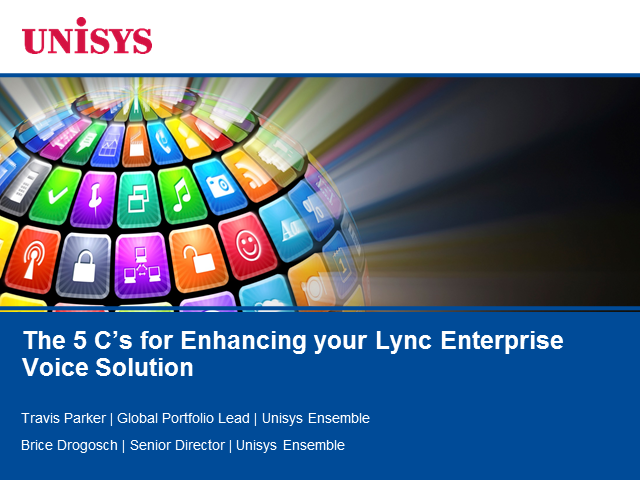 Join Unisys as we discuss the 5 C’s for enhancing your business communication tools by leveraging voice, video conferencing and more. Ensemble UC provides a certified end-to-end offering to deliver Lync Enterprise Voice and the premium support and operation services to make it a success.